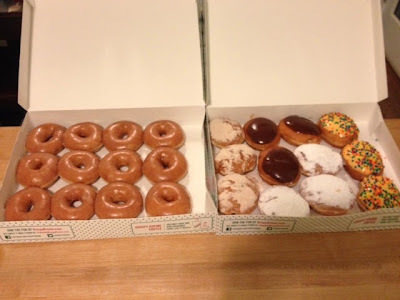 Rebecca Mast: Happy 77th Birthday, Krispy Kreme! Happy 77th Birthday, Krispy Kreme! Today was Krispy Kreme's 77th birthday. 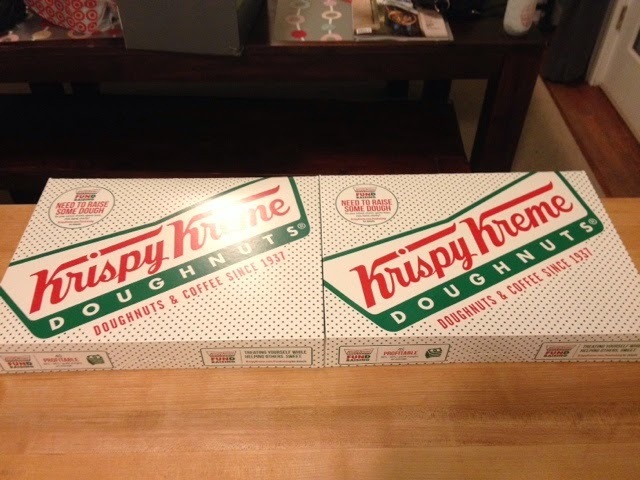 To celebrate, they offered this deal: Buy one dozen doughnuts and get the second dozen for 77 cents. 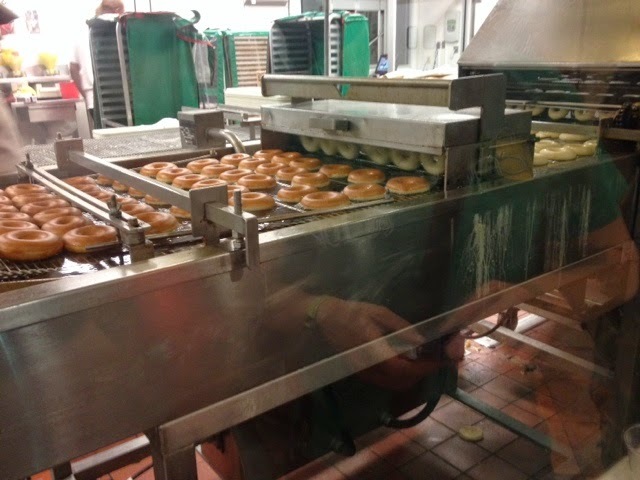 The line and drive-through at the Richmond Krispy Kreme wrapped around the building all day. We went at 10 P.M. in the hopes that the line would be shorter, but there was no such luck. We waited in line for about an hour and a half to get our massively discounted doughnuts. It was okay; I got free samples of two different doughnut holes and a citrus-y slushy drink. To pass the time, I took pictures of the doughnuts at each stage visible from the big window. We dubbed this the "doughnut elevator." All the dough is arranged on this conveyor belt, snaking around, some shelves going up, some going down. 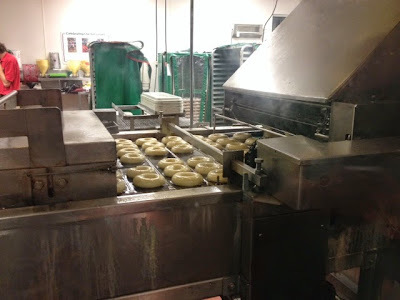 ...and then a part of the machine flipped the floating doughnuts over so they'd fry on the other side, too. 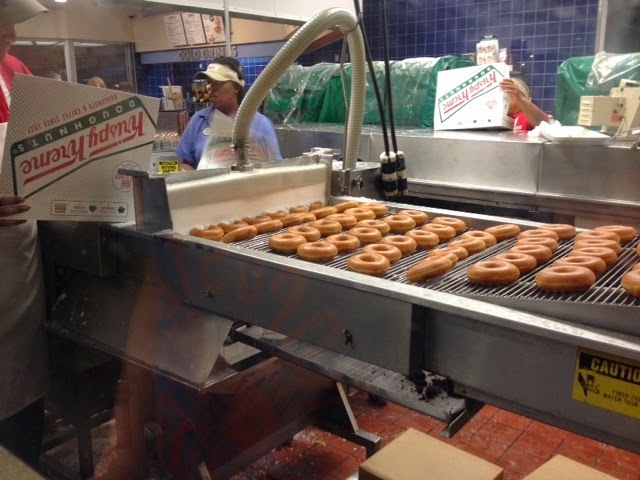 Then, with the grease dripping down through the slats, the doughnuts passed under a heavenly waterfall of glaze. 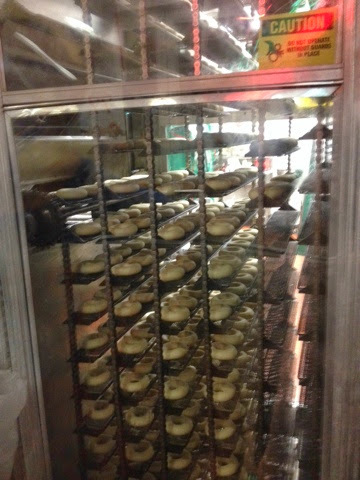 Krispy Kreme employees hooked the glazed doughnuts out with a plastic stick and packed them into boxes by the dozen. And that's how my doughnuts got into these boxes. Mmmmmmmmmm. Happy Birthday, Krispy Kreme! Here's to another 77 years of deliciousness! NO, I haven't eaten them all already. I've only eaten two. Happy Independence Day from the Beach and Zoo!